This oft used idiom describes something of great value and importance. Frequently, the item being praised has minimal intrinsic value – but the value to the user can be immeasurable. A canteen of water in the desert is worth its weight in gold. So is a parking spot on Park Avenue from time to time! Here’s a question to ponder: “Is gold ‘worth its weight in gold’ for investors?” Judging by some of the headlines during the past several years, you’d think that gold is worth more than its weight in gold! Let’s look at three popular claims regarding gold. Many people tout gold as a “safe-haven asset,” and rarely describe it as “volatile” and “risky.” However, a recent look at gold’s performance seems to contradict the safe haven theory. The last time RCG commented on gold was in our September 2011 article titled, “I’m Melting, I’m Melting!! !” At that time, gold was changing hands at around $1,800 an ounce. Today, it is trading for roughly $1,200 an ounce – a 33% decline in price! Most rational investors wouldn’t consider a 33% loss over three years to be inherently safe. Proponents of gold also suggest adding the metal to an investment portfolio as protection against inflation. But if that were the case, you would expect the two to move in lockstep with each other. In other words, as inflation rises, gold prices would also rise to protect your purchasing power. 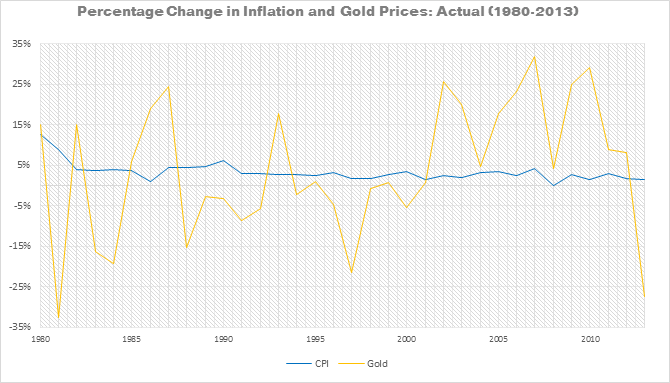 But, in fact, over the past 33 years, there has been almost no correlation between inflation (as measured by the CPI) and gold prices (see the chart below). If anything, gold has simply added more volatility to a portfolio. 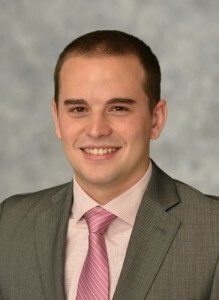 In a more recent paper published in March 2014 – “On the Economic Determinants of the Gold-Inflation Relation” – three researchers from universities in the U.S., U.K. and Australia stated that they, too, find no supportive evidence of a connection to gold and the CPI. It appears that gold might be a better anniversary gift than a hedge against inflation. What about gold as a pure investment? Over the past 33 years, the precious metal has increased in value at a rate of 2.55 percent annually. Inflation during the same timeframe grew at 3.33%. So, in nominal terms, an investment in gold would not have kept up with inflation and also would have subjected the portfolio to increased volatility. Even One-Month U.S. Treasury Bills earned 4.84% annually during this time period, and did so with much less volatility and a lower correlation to stocks. The decision to purchase gold as part of an investment portfolio is often motivated by emotional and psychological factors. The academic research that is the basis for our investment philosophy shows that making decisions in this manner can be harmful to harnessing market performance and achieving long-term financial success. In reality, investing in gold is no more than a bet that in the future someone else will be willing to pay you more than your purchase price. It‘s a good thing that gold makes such beautiful jewelry, because when it comes to inclusion in an investment portfolio, all that glitters is not gold.